« 191 - Why do we refuse to do maths? Following on from essay 191, I wonder if it is worth writing some collected thoughts on hill-walking. My objective here is to provide some suggestions that may help those who want to gain the most from a day. So this is specifically personal and you may well disagree from the outset at my implied objectives. I spent the best part of 15 years training (being one of several such) teams to perform at TenTors. 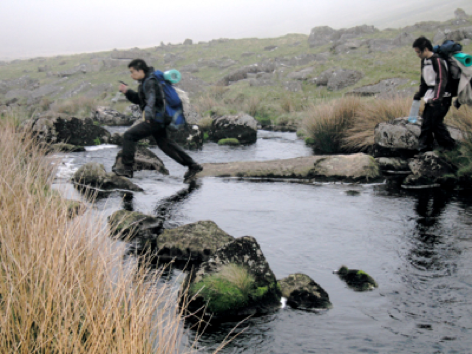 This is an officially non-competitive event in which teams of six attempt to visit ten Dartmoor peaks, at nominal total distances of 35, 45 or 55 miles in a time period of 27-34 hours. ¹ I somehow always ended up shadowing, shepherding and sometimes advising the 55-mile team, for whom 55 miles point to point on a map actually ends up being 100km on the ground. Given that teams are required (expected) to stop for eight hours, we were looking at 18-24 available hours, perhaps (on 2015 rules) two to four more by stealing from the expected down time. [55 teams would, I expect, aim to clock into say Tor 7 before 22:00 and walk on towards Tor 8 before stopping, clocking in at Tor 8 close to 06:00 on Sunday. Of course, everyone is advised to be camped between 20:00 and 06:00 but the teams somehow adopt aggressively competitive attitudes. • being sufficiently aware of the moor to navigate reliably between the possible combinations of tors. In particular it is a significant help to have learned which routes you really dislike. • learning to walk at a speed that means you are able to finish with a modicum of time in hand for contingencies. The 35 mile teams have few problems. Distance on the ground is about 60km, which means that a mean 3kph will result in 20 hours walking. No problem then, once 20 hours is itself achievable. The 45 mile teams begin to have problems, though the strong teams do not. Ground to cover is around 80km so 3kph won’t work and 20 hours suggests 4kph is needed. The 55 mile teams do have difficulty. 100km at 5kph is 20 hours and at 4kph is 25 hours—of walking. So that slower speed might allow a finish. Consequently, the training target is always going to be to better 5kph for as long as possible. • Can you walk that fast on Dartmoor? • Can you reduce your stopping time to sufficiently small proportions that the walking time is large enough to complete the route? • Can you do anything to improve your speed across the ground? In itself that implied ability to walk at 5kph for a long time is a statement that needs testing by you so you can appreciate what 5, 5.5 or 6kph feels like: Once you have that in mind, you can start to discover if you can do that for many hours in a row. This is not the same as running, being not as restrictively aerobic (meaning many of us hit a limiting speed defined by our ability to take in oxygen; when walking we rarely reach panting on flat ground). Yes, you can walk at 5kph on Dartmoor, if you choose the ground carefully. But that isn’t the point: you need to average 5kph, which means you’re actually walking at some pace faster than 5kph. Think of areas of tussock grass, especially where each clump is the size of a skull. Think of all the wet places, though I might argue that Dartmoor, while wet, is less bad than much of the Pennines, mostly because there is usually less traffic on the soggy parts, so you’re not spending a large amount of time looking for the least wet route. There are many places where 3kph is appreciably quick. There are few places where 7kph is achievable: I did 7kph last week with no effort for the last hour of seven, but it was on an empty road; I have managed 8kph on stony tracks in the Lake District but that was by consciously pushing the pace. I often managed 7kph in the late afternoon on the grassy slopes on the west side of Dartmoor but we should recognise I carry light loads and I’m already pretty hill-fit, so I’m on the fast side of any statistical distribution. But it can be done. So routes need to be well understood, and/or the map-reading is so very good it causes no stoppage time. Teams have to be sufficiently well organised that stoppage time is under 5 minutes per hour. I really do mean organised; once you inspect why it is you have stopped in the past, you rapidly realise that very few of these need to occur. If one person stops, does everyone need to? If you walk at 5kph for 50 minutes per hour; your mean speed is reduced to 4.2kph. To keep the mean up at 5kph each hour you need to actually walk at 6kph. To achieve 5kph on a stoppage time of 5 mins per hour, your target speed for actual movement is 5.5 kph. It might be better to organise your kit so that drinking occurs while still walking, to consider not stopping for lunch but walking on (while eating), and on planning a significant but time-efficient stop at, say, six hours intervals. 30 minutes out every six hours is still 5 minutes per hour, but 30 minutes might allow a cooked meal. Alternatively, you might calculate an hour of stoppage on Saturday and none on Sunday, leaving you (as a 55 team) something like 14 hours walking on Saturday (70km, perhaps the maximum allowable eight tors achieved) and Sunday will then be painful but okay. 70km on Saturday in 14 hours (07:00-21:00 plus an hour stoppage) is 5kph. So you’d really like to be able to show you can go faster than 5kph on the moor, so as to have a little leeway. Essay 191 illustrated the need to reduce stoppage time and that aiming off on faster tracks can pay off handsomely. Thus the 55 team learns, eventually, that 5kph is the minimum acceptable speed. 45 teams aim at 5kph, 35 teams aspire to it. Experience says that the typical PMC senior team really can average 5kph, which is an actual walking speed of 5.5kph, maintained across a long, long day. It means that on better surfaces speeds are nearer 6.5kph. That’s just over 4 miles an hour and, if you’re saying to yourself “That’s doable”, remember (i) this is with a heavy pack (you’re going to camp the night and you’re quite likely to have to prove you’re properly equipped at some point in the walk) and (ii) you’re looking to do this all day, not just for three of four hours. So, the lessons learned then apply to romping around other hills in Britain. I don’t need to stop to look at the view, though I can choose to do that. I discover that I seize up pretty quickly if I stop, so my rucsac supplies drink on demand with no need to stop; my map is tucked in the gap between back of my sac and myself (and tied on so it doesn’t blow away); I have a compass in every jacket and one in the sac, and that means there is always one within two seconds reach. My hill-food is packed by me in little pots suitable for eating on the hoof, so a typical day such as last week on Cheviot entails six hours of walking and under 5 minutes stoppage. I aim to have one minute off per hour and I walk for six to eight hours like this. I slow down after eight (it is simply lack of practice, lack of need to go further and, if I’m completely honest, by then I’ve had enough). Taking the total up to ten hours means I don’t much enjoy the last two—and I have to guard against making mistakes (tripping over, assuming route knowledge without checking, etc). There are rules for calculating time walking, based on distance and climb required, Naismith being the most-quoted rule. Back when I was a teenager, I learned I did 4 mph and 2500 ft an hour, that’s 6.25 kph and 800m/hr. 45 years later I’m a little bit slower across the ground and quite a lot slower up and downhill, but I stop an awful lot less often. I don’t bother to calculate the numbers any more; it takes as long as it takes and I’ll modify my day or route to accommodate how I feel, how the weather is, how the ground is today. In other words, my enjoyment of the walking is not so heavily governed by the need for speed, much more by the perceived value of the day in terms of experience, pleasure and exercise. It is also true to say that the calculation using Naismith, however modified, was never very accurate, being affected so easily by that list of unknowns (ground surface, etc). If the visibility is good I have a pretty good idea of minutes to the next waypoint and the one after that. Doing the arithmetic with error bounds on every value does not produce data (results) that are very useful, except inasmuch as it helps you estimate current position and time to the next immediately recognisable feature, all of which I group under navigational skills, which amounts to knowing where you are and where you’re going, but includes knowing when you don’t need to worry about any of that. So I have the skill and in theory at least I can in some sense turn it on when necessary. Which really means recognising when it is going to be needed, not waiting until it is almost too late. In the sense that these calculations give one a prediction for the day, it is very simple; I am aware how fast I am covering the ground—or not—and I factor that into what decisions I take over route. I’m recording hours elapsed and distance covered, but only in the sense that I’m looking at the map and saying “That’s about right for a day, worth the drive to get there and back”. Like last week, 25 km in 5.5 hours on soggy Cheviot; or the week before, 32km in 7 hours over Blencathra, Skiddaw and at least three other things in between. The Lakes is or are appreciably less soggy than Cheviot, but hillier, so much the same in elapsed apparent speed across the map. So I now use the information as feedback to inform what it is I achieve in the day: I choose routes so that the options for more or for less occur in the later part of the day, by which time I am aware what today’s pace is, how the ground is affecting that and I can measure what more I want to do against the opportunities for choices of route. That doesn’t necessarily mean I put the fun bits in first, either, but it does allow me to maximise the element of enjoyment. I thought, as I wrote this, that I’ve written much the same on an earlier page. I can’t find it. 1 As I remember these rules, no-one was allowed past Tor 8 before 0600 on the Sunday, having started 0700 Saturday. ’35’ teams are required to stop at or before 20:00 Saturday at a designated site (near their evening tor, typically Tor 6-8, and not allowed to proceed to their next tor). 45s were given slightly more leeway where to camp and 55s were allowed to walk on and camp properly wild, often aiming to be just short of their ‘next’ tor, so as to clock in there early on the Sunday. Tors ‘closed’ at 20:00. I see from the 2015 rules that the wild camping is now extended to 45s and 55s and that tors close at 22:00 (20:00 for 35s). I take that as meaning that the kids are (i) trusted to camp wild and (ii) perhaps prepared to admit to walking more hours. See the rules, particularly rule 65.1-3. Walkers must carry a minimum of equipment, amounting to quite a lot, even if modern, expensive and light. You may not finish after 1700 Sunday. The very fastest teams start arriving at the finish around 10:00 Sunday. Subsequently checking a little, I found I am doing 300m climb in 30 mins ignoring the distance walked, on a good surface. So my 60+ Naismith numbers are, perhaps, 6 kph and 600m per hour, down from 6.25 and 800. On a similar surface going down I can be extremely quick, like close to five minutes, but it doesn’t take much in terms of gradient or surface to double or treble that time. I will admit that there are many hills whose surfaces are sufficiently rough that I am now quicker going up than going down. I need to keep my knees working. So predicting the time off the map is pretty hopeless if the ground surface has such a large effect on the achieved speed, despite all the exhortations when ‘teaching’ this stuff. It all makes sense only when you start allowing for ‘error’, but most of us find that the error overhead is simply too much to hold in our heads. And too much for the gain perceived, too. I reckon that adding the error certainly doubles what you’re trying to remember. So it is far better to simply learn that <that walk> is about <that time> and therefore <that similar walk> will be <similar time>. As if it really matters. Better still, then, to have left oneself options to change the route so as to best enjoy the day. Which is what I do, go for the most fun available. Your idea of fun will be different from mine. What I do these days is roughly count kilometre squares, divide by five and call that hours; then I look at ‘escape routes‘ so I can change my mind based on weather and whim. This gives me a smaller number (of hours or km) which is the ‘shortest day’ version. Most days I meet fewer than a dozen people, but it rather depends on whether my route includes what you might call a ‘famous’ peak. I’ve been over each of Cheviot, Ben Nevis, Snowdon, Skiddaw, Blencathra and Helvellyn—even Sca Fell Pike—and met no-one all day; I’ve been on each of those and met over 100 other walkers; it depends on the weather, the day of the week and the time of year. For one of the well-known peaks to be empty, something is pretty extreme, probably time of day or the weather, but sometimes chosen route: SFP empty was in daylight, but once very early and once very late in the day; whenever I’ve been up there in bad weather there have been people on the top when I arrive. Snowdon has been empty but for my group several times at night, and in deep snow just after dawn. I’ve been up Skiddaw and Helvellyn in extreme weather and met a surprisingly large number of people.